Dr. Mountz is a Professor of Radiology, Director of NeuroNuclear Medicine, and Chief of The Division of Nuclear Medicine, University of Pittsburgh Medical Center Health System, Pittsburgh, PA. Most combined positron emission tomography/computed tomography (PET/CT) scanners are optimized for applications in body oncology imaging and are more limited for use in neuroimaging examinations than dedicated neuro-PET or neuro-CT equipment. With proper protocols, however, most PET/CT scanners can provide excellent PET and CT brain scans if the acquisition and reconstruction parameters are appropriately selected. 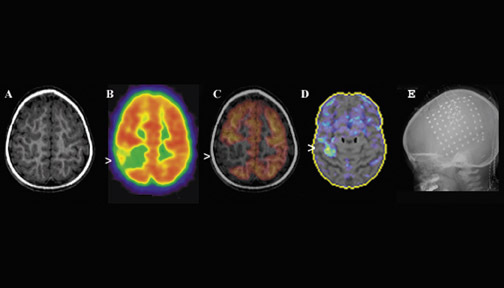 A previous article in a supplement to Applied Radiology addressed the type of radiopharmaceuticals used in central nervous system (CNS) applications and the use of PET/CT for the evaluation of dementia. 1 This article will highlight predominant applications of neuro PET/CT in epilepsy and brain tumors. Regional cerebral perfusion evaluation in patients with epilepsy has proven to be of significant clinical value for epileptogenic focus identification. The underlying pathophysiology for using regional cerebral perfusion tracers in epilepsy is based on the clinical observation that was first reported by Sir Victor Horsley more than 100 years ago. He described (by direct observation of the brain during surgery) an increase in cortical blood flow in the area of seizure discharge. Therefore, the most valuable use of single-photon-emission CT (SPECT) regional cerebral blood flow (rCBF) tracers is to localize the epileptogenic focus during the ictal state. Figure 1 illustrates the value of ictal SPECT in a 9-year-old right-handed boy who had a 7-year history of intractable seizures. The patient averaged 20 to 30 seizures a day. The seizures were characterized by an aura of tingling in the mouth, followed by simultaneous extension of the legs and flexion of the right upper extremities with nonpurposeful movements of both legs lasting 20 seconds. Multiple video electroencephalography (EEG) monitoring studies showed stereotypical seizures with no ictal scalp localization. Interictal activity revealed occasional sharp discharges involving the right frontal central parietal regions. Several CT and magnetic resonance imaging (MRI) studies were normal. A technetium (Tc)-99m hexamethyl propyleneamine oxime (HMPAO) brain SPECT scan was performed 2 hours after tracer injection (Figure 1). The tracer was injected at the patient's bedside 3 seconds after the seizure's onset (the seizure lasted approximately 25 seconds). The ictal rCBF brain SPECT scan showed a focal area of intense uptake in the right frontal lobe. The result of the ictal brain SPECT scan was subsequently coregistered with the MRI scan, and the placement of subdural grid electrodes confirmed the epileptogenic focus location. Based on the fusion image, the anatomic location was determined, the epileptogenic focus was surgically excised, and the patient was rendered seizure-free. It has been shown that well-performed ictal SPECT in patients with extratemporal lobe epilepsy has superior localization capability as compared with interictal fluorine-18 (F-18) 2-fluoro-2-deoxy-D-glucose (FDG) PET. However, if ictal SPECT is not available, identification of the epileptogenic focus during the interictal state using F-18 FDG-PET can provide localization in some cases. In cases of suspected temporal lobe epilepsy, the preferred diagnostic imaging protocol is to perform interictal F-18 FDG-PET in addition to ictal and interictal SPECT. 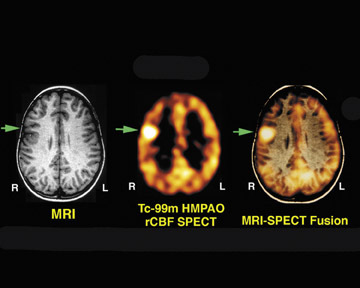 Figure 2 illustrates concordance between abnormalities on MRI and F-18 FDG-PET in a 16-year-old boy with temporal lobe epilepsy and hippocampal sclerosis of the right mesial temporal lobe on MRI. The MRI shows abnormal high signal intensity in the right hippocampal region. The FDG-PET shows a corresponding area of focal reduction of F-18 FDG uptake in the right hippocampal region. After undergoing right temporal lobectomy, the patient was rendered seizure-free. Figure 3 illustrates the significant advantage of ictal SPECT as compared with interictal F-18 FDG-PET. The patient is a 42-year-old woman who experienced 1 to 2 brief seizures per day. Seizure activity was thought to arise from the frontal lobe regions, but video-EEG monitoring was nonlocalizing. The MRI scan was normal. The F-18 FDG-PET brain scan was nonlocalizing. An ictal brain SPECT scan showed significant hyperemia in the right frontal lobe. Figure 3 shows correlative images of the significant hyperemia on ictal SPECT as compared with nonspecific reduction on FDG-PET. 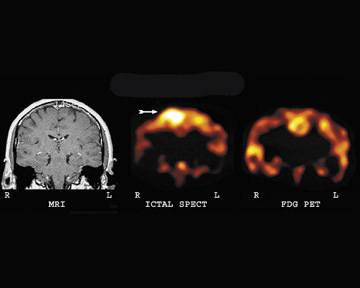 This example illustrates the relative nonspecificity of mild areas of reduction on an FDG-PET brain scan in cases of frontal lobe epilepsy. In these cases, an ictal brain SPECT scan can provide greater accuracy in diagnosis. Figure 4 illustrates epileptogenic region localization in a 2-year-old girl with intractable partial epilepsy and developmental delay. The EEG showed frequent and focal discharges from the right frontoparietal region. In this case, the F-18 FDG-PET scan localized the epileptogenic region suitable for grid placement and invasive intracranial EEG monitoring. Interictal FDG-PET studies have limited usefulness in the presence of multiple hypometabolic regions in patients with multifocal brain syndromes, such as in children with tuberous sclerosis. Such children with multifocal lesions represent a special challenge during presurgical evaluation. The goal of functional imaging in these cases is to identify the epileptogenic lesions and to differentiate them from the nonepileptogenic ones. In this context, ictal rCBF SPECT may have useful clinical applications but may be technically challenging when seizures are short, as is particularly common in frontal lobe epilepsy and in children who have infantile spasms that are associated with multifocal cortical dysplasia. 11 Figure 5 shows such a case in a 1-year-old boy with tuberous sclerosis. Anatomically, there were several lesions that were abnormal on the CT portion of the PET/ CT scan. These areas also showed reduced FDG uptake on PET. Ictal SPECT (not shown) was able to identify the dominant area of presumed epileptogenesis associated with a large tuber in the right frontal lobe. Since the introduction of CT in the mid-1970s and MRI in the early 1980s, neuroimaging has become extremely important in the diagnosis of primary and metastatic brain tumors. These various neuroradiologic imaging techniques have also found new and important applications in assisting with biopsy localization, monitoring the effects of therapy, and differentiating recurrence from radiation effect or necrosis. 12 The identification of viable tumor after therapy is a significant clinical problem, since the distinction between necrosis and residual or recurrent viable tumor cannot be accurately evaluated by either CT or MRI. 13-15 Functional imaging can distinguish cerebral necrosis from viable brain tumor and determine tumor grade. 16-18 More recently, FDG-PET imaging has been shown to be of value in the prediction of tumor metabolic response to temozolomide versus temozolomide plus radiotherapy in recurrent high-grade gliomas. 19 Therefore, the monitoring of therapeutic response by PET imaging is now used to provide an early assessment of therapy efficacy and to help the oncologist optimize the therapeutic management of brain tumors. 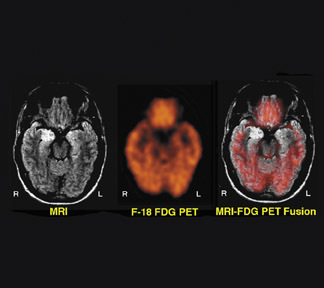 F-18 FDG-PET-- The use of F-18 FDG-PET has led to a more widespread capability in allowing the evaluation of cerebral neoplasms as well as other diseases of the brain that were previously imaged using SPECT radiopharmaceuticals. 20 In addition, due to the relatively long half-life of F-18 (109 minutes), it can be transported regionally (within approximately 2 to 4 hours travel time from a cyclotron production facility), enabling a centrally located production facility to supply several camera sites. Figure 6 shows a PET scan with abnormal uptake of F-18 FDG in a patient with a recurrent high-grade brain tumor involving the anterior frontal lobe after 8 years of remission. F-18-fluoro-3'-deoxy-3'-L-fluoro-thymidine PET for the evaluation of viable brain tumor-- F-18-fluoro-3-deoxy-3-L-fluorothymidine (F-18 FLT) has recently been developed as a proliferation tracer. Imaging and measurement of proliferation with PET can provide a noninvasive staging tool and a means to monitor the response to anticancer treatment. 21 In contrast to quiescent cells, proliferating cells synthesize deoxyribonucleic acid (DNA) during the S phase of the cell cycle. F-18-fluoro-3-deoxy-3-L-fluorothymidine is taken up by the cell via both passive diffusion and facilitated transport by Na + -dependent carriers. Subsequently, F-18 FLT is phosphorylated by thymidine kinase 1 (TK1) into F-18 FLT-monophosphate, after which it is trapped in the cell (Figure 7). Thymidine kinase 1 is a principal enzyme in the salvage pathway of DNA synthesis. The enzymatic activity of TK1 is virtually absent in quiescent cells, but in proliferating cells it reaches a maximum in the late G1 and S phases of the cell cycle. 22 Therefore, the phosphorylation by TK1 forms the basis of F-18 FLT as a proliferation tracer. F-18-fluoro-3'-deoxy-3'-L-fluorothymidine has been used to indicate tumor proliferation in both preclinical and clinical studies. 23,24 The imaging of brain tumor proliferative activity has been performed using semiquantitative measures of standard uptake values. [F-18]-fluoro-3'-deoxy-3'-L-fluorothymidine imaging can be correlated with stereotactic biopsies representing the Ki-67 proliferation index. Recurrent or residual viable tumor showed an increased quantitative FLT utilization and can provide a useful index to separate residual or recurrent viable tumor from radiation or chemotherapy necrosis. [F-18]-fluoro-3'-deoxy-3'-L-fluorothymidine is more specific for detection of viable tumor proliferation, since the background activity in normal brain is low (Figure 8), unlike F-18, which has a high normal brain background. Figure 9 shows tissue histology and staining with MIB-1 to allow correlation between F-18 FLT uptake and the proliferation index Ki-67. PET imaging of radiolabeled amino acids for brain tumor assessment-- Radiolabeled amino acids are becoming increasingly useful as tracers for the delineation of tumors, particularly brain neoplasms. Unlike FDG, the radiolabeled amino acids are not taken up by normal cortical gray matter and provide a greater target-to-background contrast, thus allowing better characterization and differentiation of the tumor from the normal cortical gray matter. The most commonly used PET amino acid radiotracer to date has been l-[methyl-C-11] methionine (C-11 MET). However, due to the 20-minute half-life of C-11-labeled tracers that requires the need for in-house cy-clotron production, amino acids labeled with F-18 are of particular interest because of their advantageously longer half-life and possibility for commercial availability. Recently, improved labeling procedures have overcome some limitations of tracer synthesis for routine PET application. The tracer 3,4-dihy-droxy-6-F-18-fluoro-L-phenylalanine ( 18 F-FDOPA) is a new amino acid, which has been recently evaluated. 25 Both high-grade and low-grade tumors are well visualized with 18 F-FDOPA. The sensitivity for identifying tumors was substantially higher with 18 F-FDOPA PET than with 18 F-FDG-PET at comparable specificities, especially for the assessment of low-grade tumors. 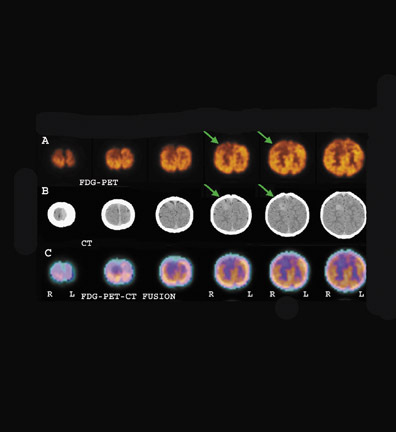 Therefore, 18 F-FDOPA PET may prove especially useful for imaging of recurrent low-grade tumors and for distinguishing tumor recurrence from radiation necrosis. By developing ictal and interictal SPECT capability in addition to F-18 FDG-PET, the radiologist can better provide the neurosurgeon with more definite presurgical location of epileptogenic foci. With the advancement of new therapies for the treatment of brain tumor, it is important to provide more accurate assessment of tumor grade on initial diagnosis and better diagnosis of recurrent viable tumor versus chemoradiation necrosis on early follow-up PET scans after therapy for both low- and high-grade brain tumors. PET/CT neuroimaging applications for epilepsy and cerebral neoplasm. Appl Radiol.